No, cocktails did not lead to the mistake. Cocktails reminded me that we all make mistakes. Allow me to explain…. I’ve made a new friend. The great thing about new friends, is they have a tendency to introduce you to new things, as well as new perspectives. And I appreciate both. New friend invites me to cocktail competition of which they are judging. I’m watching, intrigued, at everything going on. I’m asking questions, trying to understand everything that goes into all of this and what could you possibly be judging other than the taste of the drink itself. Oooooh, trust me, there were a lot more items that go into it than just the taste. So we talk afterward and he proceeds to enlighten me on mistakes that were made during what I thought were good presentations, and even better drinks. And while he is taking the time to point out mistakes and explain the elaborate judging criteria, I was reminded of my own mistake in recent weeks…. We all have been there at one point or another, wherein you’ve made a decision, that probably wasn’t the wisest decision ever made. Of which can be viewed as a mistake. It’s both. Trust me. A bad decision, is ultimately a mistake. 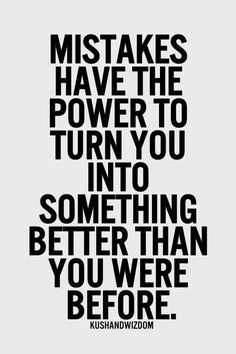 The decision to make the mistake, wasn’t viewed as a mistake at the time, it was legitimately though to be a resourceful idea, that’s what we sometimes do as property managers, be resourceful. Although….the err in my ways, if I had asked questions, I wouldn’t have had to of been resourceful at all. And no mistake would have been made. Pride is a cold and lonely mountain (lesson #1). My resourcefulness was not well thought out, and turned out to be a mistake. For a number of different reasons. I’ve spent the last few weeks rehashing the entire thing in my brain, because as a Type A overachiever, making a mistake and disappointing anyone is not something I’m regularly familiar with. I’ve chastised myself more than needed probably. It’s incredibly hard for a perfectionist of my level to accept that. Accept what? That I’m not perfect. But here’s the thing, I’m not perfect, none of us are (lesson #2).